Wait! There’s a Science Daily version. Brain boost: Research to improve memory through electricity? More important, the researchers identified the actual molecular trigger behind the bolstered memory and plasticity–increased production of BDNF, a protein essential to brain growth. BDNF, which stands for “brain-derived neurotrophic factor,” is synthesized naturally by neurons and is crucial to neuronal development and specialization. The research is sponsored by the Office of Naval Research! Podda, M. V. et al. Anodal transcranial direct current stimulation boosts synaptic plasticity and memory in mice via epigenetic regulation of Bdnf expression. Sci. Rep. 6, 22180; doi: 10.1038/srep22180 (2016). But this paper suggests the actual mechanism for how this is happening. 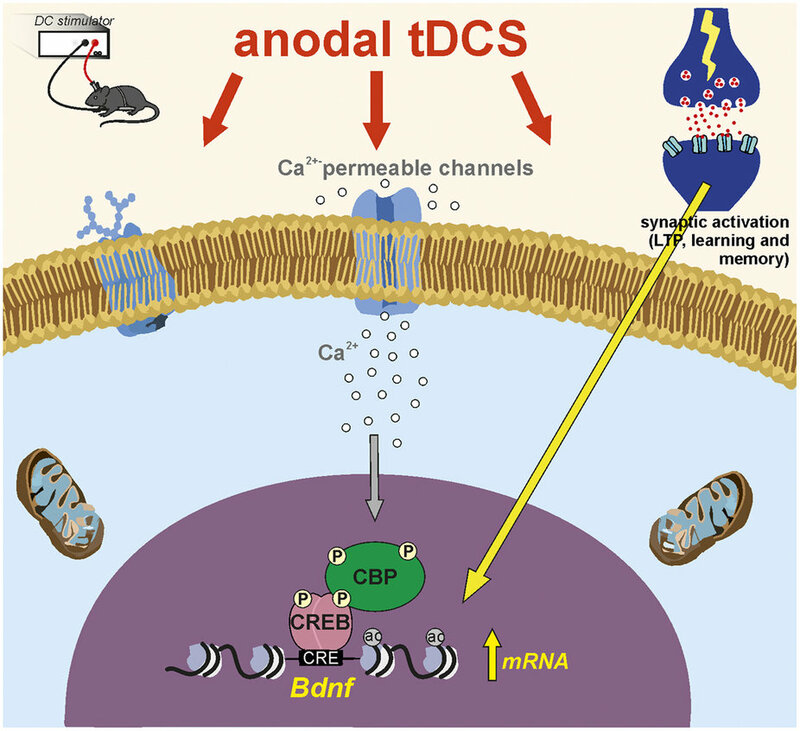 We hypothesized that anodal tDCS induced membrane depolarization mimicking neuronal activation and triggered epigenetic changes at Bdnf, thus favoring its transcription. All together these results indicate that Bdnf expression in the hippocampus is induced by anodal tDCS and that enhanced acetylation at Bdnf promoter I is likely responsible for such effect. Collectively, these data suggest that anodal tDCS induced epigenetic changes at Bdnf promoters likely relying on a mechanism involving CREB activation, CBP recruitment and H3K9 acetylation. These results strongly support our hypothesis that increased histone acetylation promoting Bdnf transcription plays a major role in anodal tDCS-induced enhancement of synaptic plasticity.